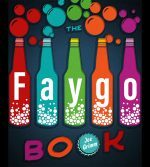 I wrote "The Faygo Book," published in October, 2018, after building up a tremendous thirst on my previous book with Wayne State University Press, "Coney Detroit." Since "The Faygo Book" came out, I have been traveling all over Michigan talking about Faygo, answering questions and hearing some wonderful stories about this great pop. I’m so happy that The Faygo Book will be featured with some great books and authors. Also happy that Faygo is providing some bubbly. Will I see you there? Thanks, Michael Hodges and The Detroit News for the article.